The Alexander C. Humphreys estate designed by C.P.H. 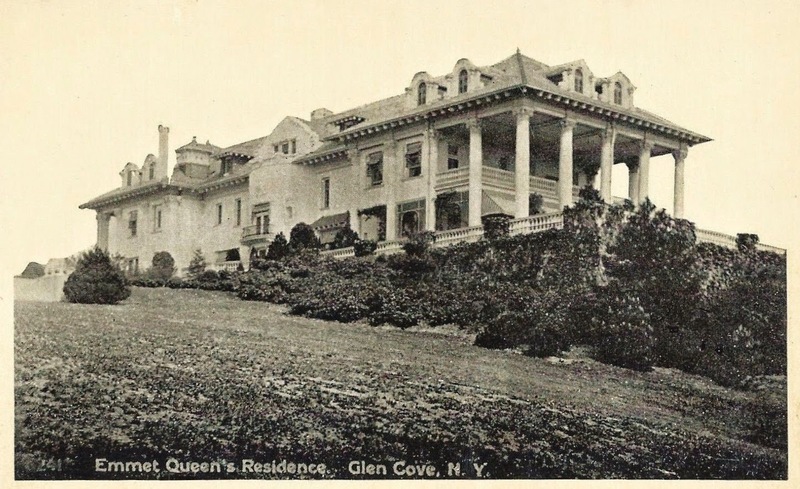 Gilbert c. 1899 in Glen Cove. Click HERE for more on the residence which burned in 1916 and was replaced with the current 'Winfield Hall'. Any news on what's going on with Winfield Hall? CPH Gilbert was nothing if not inventive and free spirited in his disregard for architectural convention and precedent. Whether or not you approve of the outcome, it's hard not to admire that "seat of the pants" confidence that welded a somewhat Moorish style stuccoed mansion to a Corinthian columned portico. It speaks very much to it it's era and to our Country's "can do" attitude and willingness to sweep aside old protocols. Was it not more common during this time period after Americans returned from the Grand Tour wanting to establish themselves with instant century old family seats that most homes followed fairly eclectic but specific design principles? There was the ubiquitous French drawing room, the Tudor dining hall, the Moorish Smoking Room, etc. Eclecticism was much more the norm unless one desired an exact replica of a French Chateau for which you then hired Horace Trumbauer to copy one for you. Very much like the almost picturesque quality of the building elements before it was rebuilt into the current marble edifice. Trumbauer did NOT copy French buildings as a general rule, creating mere replicas. He did, one time, create a near copy of an Italianate villa in Greenwich for the Elkins family (near Philadelphia). Even that mansion had a completely different floor plan from the one in Greenwich, and the design was requested by Mr. Elkins. He also created a near (but larger) replica of one of his own Newport houses in Grosse Point at the request of Mrs. Horace Dodge. The rest of his great house designs, although influenced by French and English models, were a far cry from mere copies. For example,"The Elms" in Newport, while modeled after a chateau outside of Paris, was not only far different from the original, but, in many ways, it was a vastly superior design. Indeed, he frequently improved upon his original 18th century models. Although Trumbauer was more faithful to original 18th century architecture than most architects of his era, his creations were hardly lacking in originality.